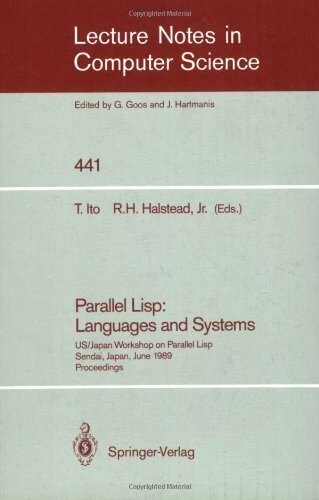 This volume presents the proceedings of a workshop at which major Parallel Lisp activities in the US and Japan were explained. Work covered includes Multilisp and Mul-T at MIT, Qlisp at Stanford, Lucid and Parcel at Illinois, PaiLisp at Tohoku University, Multiprocessor Lisp on TOP-1 at IBM Tokyo Research, and concurrent programming in TAO. Most papers present languages and systems of Parallel Lisp and are in particular concerned with: - Language constructs of Parallel Lisp and their meanings from the standpoint of implementing Parallel Lisp systems; - Some important technical issues such as parallel garbage collection, dynamic task partitioning, futures and continuations in parallelism, automatic parallelization of Lisp programs, and the kernel concept of Parallel Lisp. Some performance results are reported that suggest practical applicability of Parallel Lisp systems in the near future. Several papers on concurrent object-oriented systems are also included. View More In Systems Analysis & Design. If you have any questions about this product by Springer Verlag, contact us by completing and submitting the form below. If you are looking for a specif part number, please include it with your message.